Yesterday we looked at the impact the 2011 class is having with Virginia last season. Today, we will look at how the rookies preformed this season. And while it is hard to see the numbers after one year, there were some outstanding performances in this class. Only nine true 1st years saw the field this year, but the impact of this class depth should be felt this season. (NOTE: For those of you counting, Ian Frye is the 9th player, who was a recruited walk-on). Eli Harold, DE: 2-deep (12/1). T-10th on team in tackles with 36. 4th on team with 7 tackles for loss, 1st in TFL yardage with 32. T-3rd with 2 sacks for 18 yards. 2nd on teams in interceptions with 1. Last year I said he was a man among boys. He still is. It took a little time for him to catch up to the college speed, but at the end of the year, you could see he will be something special at UVa. I would like to say we will have him for the next 3 years, but we all know that at this rate, he won’t make it past his 3rd year. Harold will be a starter right out of the gate next year and with Tenuta calling his blitz happy defense, look for match up issues off the edge leading to a stellar season. Kwontie Moore, LB: 2-Deep (12/0). 4 total tackles. Hey, when you play behind Steve Greer, you don’t see much time on the field. Just ask Coley, who had to move around to get some more playing time. Now that Greer is heading out, it will come down to a battle between Moore and Coley for that starting MLB spot. Either way, he will have a full off-season to bulk up and will see the field a lot more this season. Canaan Severin, ATH/WR: Role Player (12/0). 1 catch, 3 yards. Canaan got caught up in the massive influx of receivers and didn’t see the field as much as we had hoped for. That is not to say he won’t see the field a lot more in the coming years. He has great size and can be used in a wide variety of ways. It might not show in ’13, but look for him to break out soon. Michael Moore, DE: 2-deep (12/0). 14 total tackles. 1 TFL for 9 yards. We predicted that it is not hard to envision Moore and Harold will bookend this defensive line in the very near future. And while Jake Snyder might have something to say about it next year, Moore will see the field a ton next year and should bulk up those stats. Courtnye Wynn, DE/DT: Redshirt. This looks like a great move for Virginia to break up all these talented ends by shirting Wynn. He might not get into the 2-deep with 3 of the 4 spots filled and players like Bailey and Corney competing, but will have a shot at some decent playing time. Demeitre Brim, ATH/LB/S: Role Player (11/0) 8 total tackles. 0.5 TFL. 0.5 sacks. 2 forced fumbles. It was hard to peg down a position for Brim, and he was moved around a little in Fall Ball before settling in at OLB. He had a solid campaign for a 1st year and should see his stock rise next year as 2 starters graduate at LB. Now instead of sliming down, he will be bulking up slightly to bring the wood from the WLB spot. Anthony Cooper, WR: Role Player (12/0). 7 total tackles. Yep, you read that right. We have been talking about the log jam at WR since, well, always. So he switched to the other side of the ball. He secured solid time as backup and nickel and dime player, and should have an opportunity to push for more playing time next year. It will get markedly harder next year with 3 more DBs coming in, but he should have a leg up on the competition. Mark Hall, LB: Redshirt. Brim ended up getting the nod over Hall last year. But no worries from Hall, as he should see some good playing time this season. Greyson Lambert, QB (currently enrolled): Redshirt. Now the fun starts. Out of Spring Ball, it looked like Lambert would really get a shot at the start, fully competing with Rocco all fall. But when Sims came on board, and more notably, was eligible to play, it was an easy call to redshirt him. Now, let’s throw into the mix Rocco’s decision to transfer, leaving an interesting question heading into 2013. With all that fallout, we now are left with 4 guaranteed non-redshirt quarterbacks. Lambert looked the part last year to start, and another full year under his belt, he will push Sims and Watford. Worse case scenario is that he is backup to Sims. Either way, the coaches will want to get him on the field to see what he can do. Kye Morgan, RB: Redshirt. Morgan was another product of the numbers game. Unfortunately, he might be in that spot again. While the Hoos lose Perry Jones, they will gain a 5* in Taquan Mizzell. The best case that he can hope for this year is he pushes Richardson and Shepherd for 3rd billing. Mario Nixon, WR: Redshirt. Slowed by injuries, Nixon used last year to get healthy. This year, he will join the mix at WR with 10 other receivers. Andre Miles-Redmond, OL/G: Redshirt. He was recruited on the OL, but will end up on the DL instead. Depending on who shows up in the 2013 class could depend on how much time AMR might see. The good news is Dean and Croce did not set themselves apart this year and Andre will have a shot to get into the mix. Sean Karl, OL/T: Redshirt. It might be hard to see past the Johnson/Whitmire tackle position, but Karl should compete for 2-deep at wherever they are not with fellow RFr. Michael Mooney. Matt Johns, QB: Redshirt. One of the 4 guaranteed QBs available next year. Could he compete? Sure, but most likely not in ’13. Michael Mooney, OL/G: Redshirt. See Sean Karl. C.J. Moore, DB: Redshirt. In a need spot like cornerback, he could have another shot to impress the new DC this year and get some playing time. Maurice Canady, ATH/DB: 2-Deep (11/2). 28 total tackles. Lead team with 2 interceptions. 3 pass break ups. 1 forced fumble and 1 fumble recovery. One of the nice surprises in this class. Canady really got it going this year and made some big plays. He might not be on the same skill level with Tra, but he will be a great 2-deep player for years. Kelvin Rainey, CB: Redshirt. Rainey is another player who will have another shot this year to get into the mix in the secondary. Adrian Gamble, WR: Role Player (12/0). We talked about him last time as he was in the ’11 class, but didn’t start until last season. 35 yards and a touchdown to start his career is promising. Tyrell Chavis, OL-G/DT: 2013 Enrollee. Chavis spent a year at Fork Union and was on board to come to UVa next year. It was a little dicey for a while when the Hoos went for the clean sweep of coaches, but it sounds like the FUMA star has settled down and tomorrow won’t be a surprise. I would put my money on Chavis staying at DT. Kyle Dockins, WR/TE: Redshirt. Kyle is still listed at WR in a crowded house. His size could see him still lineup at TE, but we will see how the fall progresses. Jamall Brown, WR: Redshirt. See every single WR. Ryan Doull, OL/G Redshirt. Another in a list of Canadians on the roster, Doull will look to break into the interior line 2-deep. Wilfred Wahee, ATH/CB: Redshirt. Wahee will still work out as CB, but might move around the defensive backfield. Max Valles, ATH/DE, 2013 Enrollee. Is coming to UVa from FUMA next year. 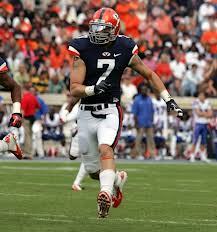 Look for him at TE, one spot that the Hoos really need in this class. Divante Walker, RB: Redshirt. Walker is moving to CB next year after the redshirt. Hopeful that he can get in the mix at corner. Conclusions: Defense and playmakers were the focus of the class, and while only 9 true 1st years saw the field, those who did will make a huge impact in the years to come. WR, CB, QB, OL added depth, but will have to wait til next year to see who will pans out.